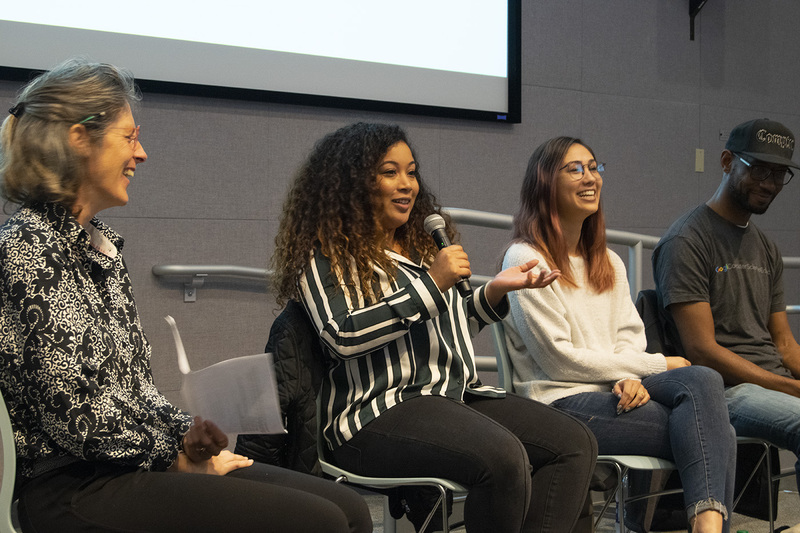 On Jan. 10, Color Coded and WISH (Women in Software and Hardware) co-hosted the “Diversity is Due” Panel, which featured three Google engineers from underrepresented groups who discussed the importance of creating more inclusive workplaces in classrooms. Two of the panelists, Bria Sullivan and Halli Santarelli graduated from Cal Poly in 2014. Panelist and UC Irvine alumnus Anthony Mays was featured in a popular 13-minute Buzzfeed video that told his story about his early life in Compton and his journey to Google. Santarelli was president of WISH for two-and-a-half years while she attended Cal Poly. She said she enjoyed her time at Cal Poly partially due to her involvement with the club and the support she felt from the other women. “When I was at Cal Poly, I felt super supported. I was a part of Wish and I was super involved and had this great community of women who were competing towards similar goals,” Santarelli said. However, Sullivan said her experience at the university was much different. Sullivan said that while attending Cal Poly, it was not uncommon for her to feel that her group mates underestimated her abilities because she was a woman of color. Sullivan said she felt a significant change when she began at Google and was part of a diverse team. The three panelists each discussed the current diversity projects they have taken on during their time at Google. Sullivan talked about a concept at Google called the “20% Project”. An employee can submit a project for approval and use 20 percent of their working time towards that specific project. Sullivan helped with a project that built a 3D installation at the National Museum of African American History and Culture Smithsonian in Washington, D.C. When the director of the museum approached Google and said that they wanted the installation to be the most, ‘advanced Smithsonian yet’, the project quickly took up almost all of her and her teammates’ time over the next year. Panelist Anthony Mays said his life as a child growing up in Compton made him extremely cautious and adverse to risk-taking. However, he said that his career at Google constantly forces him to take risks and fail. He said that he hopes kids who relate to him will take healthy risks and follow opportunities presented to them. Santarelli and Mays currently work together on a community outreach committee for the Google office in Orange County. “Our main focus is to reach as many K-12 kids as possible in the area, introduce them to tech and hope that they can find interest in tech and build tech careers,” Santarelli said. Santarelli also said she has been focusing on the importance of building a safe space and relationships within the office. She said she wanted the office to be a more welcoming environment for underrepresented groups to enter into. After the event, WISH Diversity Director and software engineering senior Louise Ibuna wrote that she was very satisfied with the turnout and audience engagement in an email to Mustang News. She wrote that her main motivation is to make sure that WISH encourages more diversity and allies within the tech field. Ibuna wrote that WISH provided a space for her free of the loneliness she felt in her classes. Software engineering sophomore and Color Coded club President Simon Ibssa said he felt the Diversity Panel was one of the first of its kind at Cal Poly and said that Color Coded has plans to continue holding events in the future. In the 2018 Google Diversity report, women make up 30.9 percent of the Google workforce globally which had increased from 30.8 percent in 2017. In the U.S. in 2017, 2.4 percent of the workforce was African American. In 2018, this statistic has increased by .1 percent to 2.5 percent.